An enlightening, joyful and engaging exhibition, Everything is a landscape… introduces us to the astonishing work of Simone and Lucien Kroll. It celebrates architecture that lends itself to the planet and its inhabitants. A standout figure in participative architecture, the couple has promoted a humanist, durable and holistic approach to urbanisation for over fifty years. Across their projects and writings, they fiercely oppose industrial modernism – its wasting of natural resources, its tendency to exclude and its taste for clean slates. 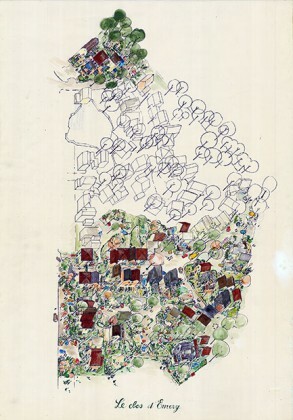 The exhibition covers the focus of their work, the prefiguration of contemporary urban ecology.